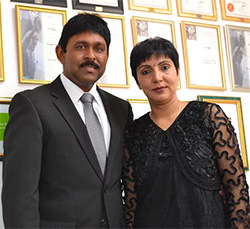 2008 saw the birth of yet another entrepreneurial family, Chucks and Roshnie Raj, who left the employment of Old Mutual Personal Financial Advice to open their own Independent Financial Planning Practice called “Chucks Raj Financial Planning”. “It’s been a wonderful 10 years at Old Mutual,” says Chucks, in which time he and Roshnie strived to build a successful practice, as well as many wonderful relationships with their clients. Both Chucks and Roshnie hail from an Education background. They served the community of Ladysmith in the Education arena for 10 and 12 years respectively, since 1989. Both were Educators at Senior Secondary Level. Chucks joined Old Mutual in 1998, and Roshnie joined him to manage his Practice at the end of 2000. During their tenure in financial planning, the couple’s practice has continuously grown. After 10 years at Old Mutual, they decided (in 2008) to start their own Independent Financial Planning Practice. Chucks and Roshnie wanted to give client’s objective advice based on clients’ individual needs, as well as on a range of the best products available in the market, instead of being limited to those of one company. Hence the establishment of Chucks Raj Financial Planning. Spring 2014 saw yet another positive change for the duo...not only did their Independent Financial Planning Practice turn 6; they also acquired a new premises for the business. 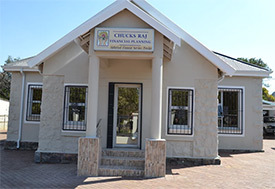 Since 1 September 2014, Chucks Raj Financial Planning has officially moved to 27 Lambton Road, Hospital Park, in Ladysmith KwaZulu Natal. In keeping with their goal of providing sound financial advice, and the best possible service to their clients, the couple decided that it would be better if they operated out of their own premises instead of a rental. This move will ensure a more personal, client-oriented environment, which is focused on financial planning; and is complimented by conveniences such as ample and secure parking for clients. Being former educators, Chucks and Roshnie place great emphasis on a sound educational background in order to provide their clients with excellent advice. Both Chucks and Roshnie have Higher Education Diplomas with Chucks majoring in Maths, Electronics, Physics and Chemistry, and Roshnie majoring in Maths and Computer Science. They both also hold a BA Degree majoring in Economics and Commercial Law. Chucks then furthered his Studies to obtain his Post graduate Diploma in Financial Planning. The couple also wrote the Financial Services Board Regulatory Examinations, and passed both the exams with exceptional results. Both Chucks and Roshnie are Key Individuals in their Practice. The duo place great emphasis on providing sound financial advice, efficient client service, and looking after the needs of their clients. They also emphasise that hard work, giving attention to detail, and understanding the needs of their clients has gotten them to where they are today. The couple attribute their success to the loving Grace of the Almighty, the continued and loyal support of their clients and the hard work put in by their dedicated and loyal staff members. Chucks and Roshnie would like to officially welcome all existing and prospective clients to their new premises, which will always have honesty and integrity as its foundation.